May 10 SIG-PM together with BTH Product Development Research Lab hosted a workshop on the topic of Product-Service Systems at BTH. 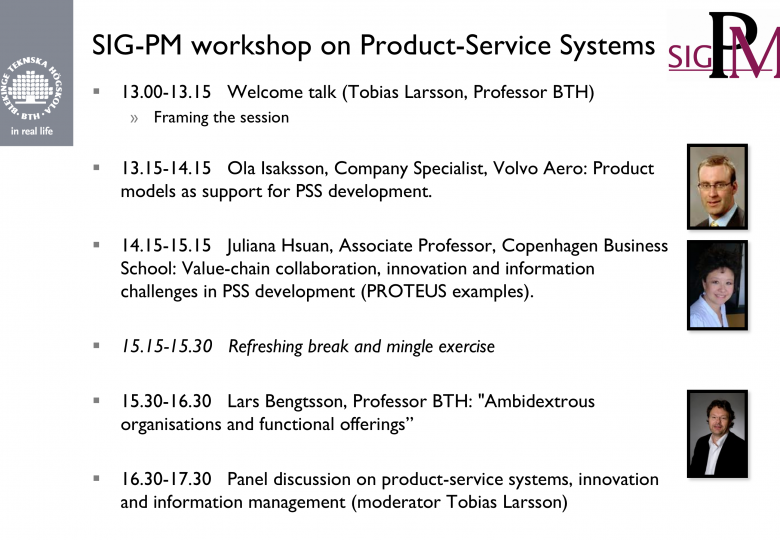 13.15-14.15 Ola Isaksson, Company Specialist, Volvo Aero: Product models as support for PSS development. 14.15-15.15 Juliana Hsuan, Associate Professor, Copenhagen Business School: Value-chain collaboration, innovation and information challenges in PSS development (PROTEUS examples). SIG PM är en förening av individer verksamma i industri, offentlig verksamhet, forskning och utbildning, med intresse för produktmodeller.